PBer Carolyn wrote and asked if I was OK? She'd seen pictures of armed soldiers in the streets of Paris. 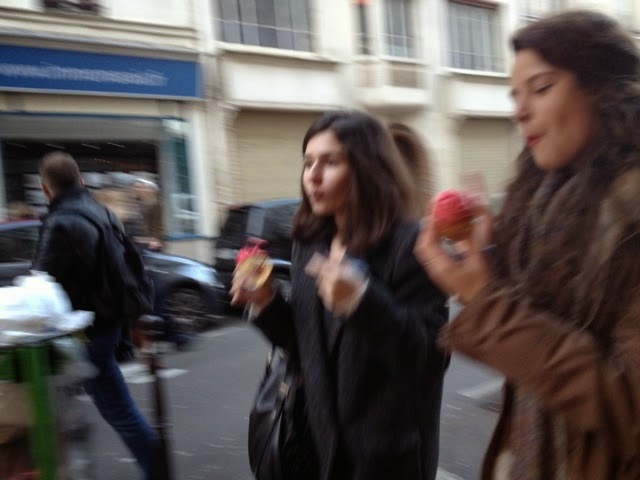 I've seen Parisians walking their little dogs and eating ice cream cones. No soldiers. The cafes were full up on Saturday, a nice sunny day. 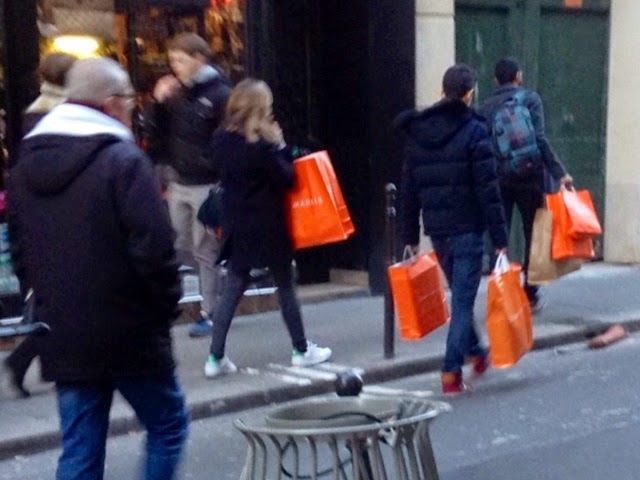 In the Marais everyone was carrying orange BHV sale bags. 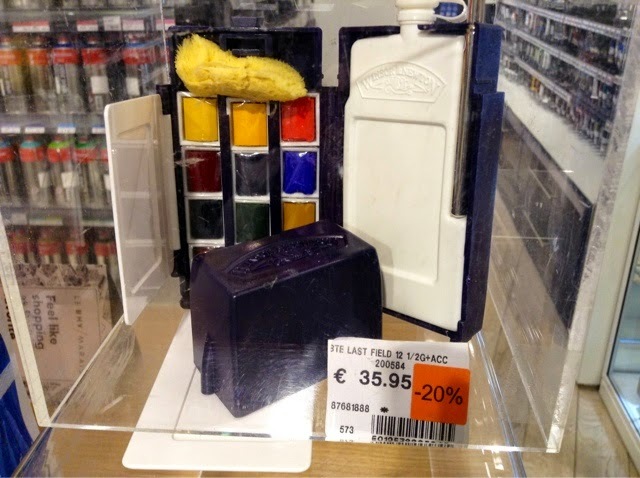 I fell hard for this little Cotman travel watercolor box on sale. Reduced from 72€ to 28€. My excuse? I will paint in cafes (my new year's resolution is to sit in a cafe now and then). I've had these travel sets before. 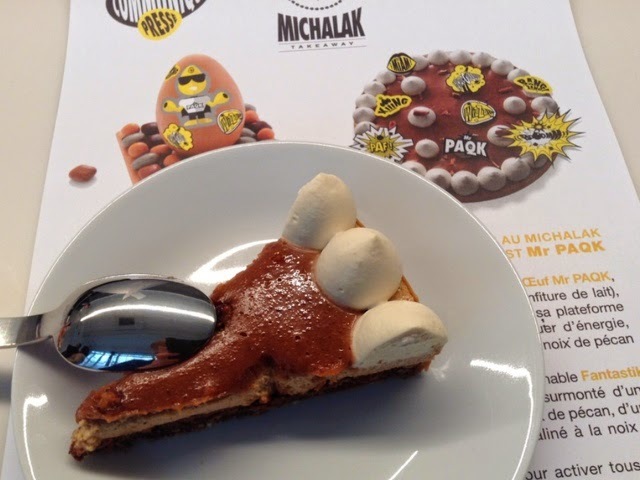 Michalak always puts a unique, whimsical twist on classic French desserts. Like this grilled croque monsieur sucre Michalak created on the spot on his new Panini toaster for us to taste. Inside Valrhona chocolate ganache, citron vert and banana sprinkled with caramelized sugar. Yum. Sunday night I was running to catch an early show of Whiplash and looked in at Un Dimanche a Paris full of people buying chocolate. A quick look inside Grim'Art, a pen shop. 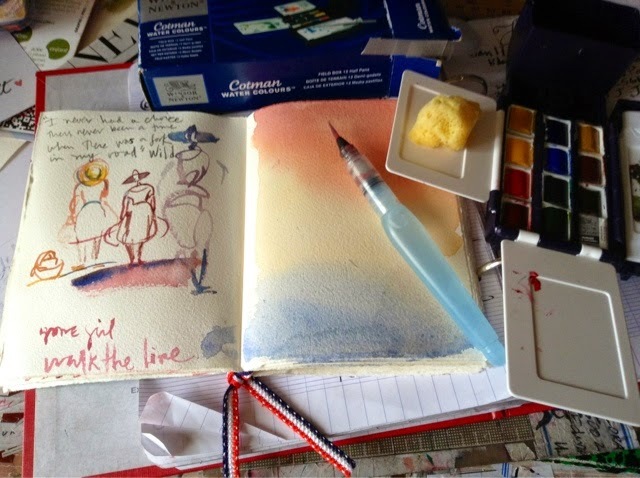 Addressing lots of envelopes, pens and calligraphy have become a recurring obsession. By the time I got to the Odeon, Whiplash was sold out. Parisians are going to the movies folks. Walking home I passed the 3-day vide grenier/brocante(outdoor antique market) at Mutualite-Maubert. I went and saw Whiplash tonight. Excellent. When I came out of the theatre the cafes were filled with people. 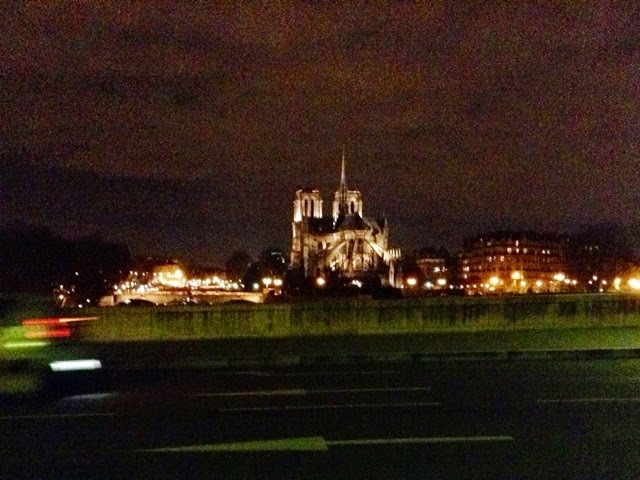 Notre Dame is beautiful as ever too. You look (timelessly) tres chic! ....oops... And of course it's wonderful that life goes on, as it must. I am intrigued by the sweet version of a croque monseieur. Yum! And I am happy to see that life..does..in fact..go on.. But I have found..with my years..that life does in fact go on..if it's not about you..straight on ..you..Sounds direct..but ..it is a truth to me..
On a happier note one of my daughters picked up her son at school one day and said:"do you want to go home or shall we see a movie? "He picked movie..
Today ..in my emails I had a photo of Noah..trying to gulp a Bonne Maman mini marmalade I brought over with scones yesterday..She said he was trying to be Paddington..guess I have to see the movie now..
and guess who I thought of:)? I can't believe I forgot to say..I love M.Michalak:) because of :"Qui sera le prochain..etc..":)..your art..and my mom's silverware. J'aime Paris ! You make me love Paris ! 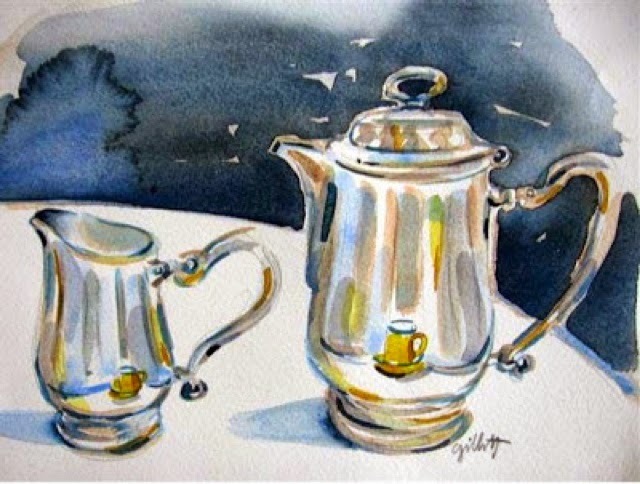 Great watercolors and your night shots are excellent - I love to look at the cafes & the patrons. I'm glad that things are normal there & I certainly hope that they stay that way! Paris is not easy on the bod. Well, at least you are there - on your island! Love my island...it should be called Ile St. Ice Cream. Beautiful post today Carol! And I love the picture of you ...very special ! Love your post! 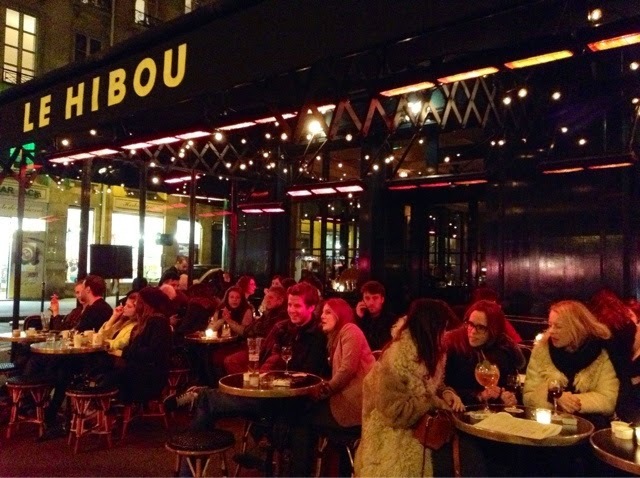 Great to see life as usual, especially my old stomping ground Le Hibou...oh to be there now! Sitting outside in the winter:))). And the sweet Croque, who knew! Enjoy yourself, you lucky lady!!! That's a brill idea Felicity! I never thought of doing cafe interiors...why not? It's going to the top of my 2015 To-Do list. The interior of Angelina"s was my favorite of the 2014 "Sketch Letters". I loved the colors of the walls and the details. 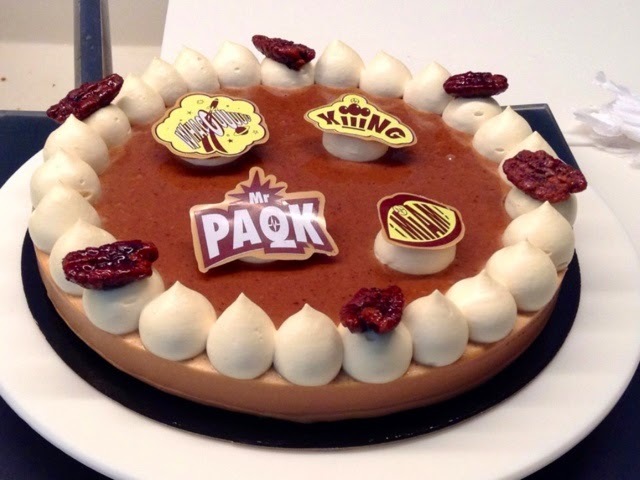 That chocolate tarte with the caramelized pecans!!! That's such good news. Although of course there is always a security presence on the streets of Paris. We had a lovely lunch at Le Hibou last year. Sadly I remain unfamiliar with the works of Christophe Michalak -but he is on the wishlist for next trip. And I don't think I've heard of Whiplash. and will send asap when I find it. I think it was a Polaroid.Have fun with your new/old paintbox. Happy and joy and a post we all need to see! 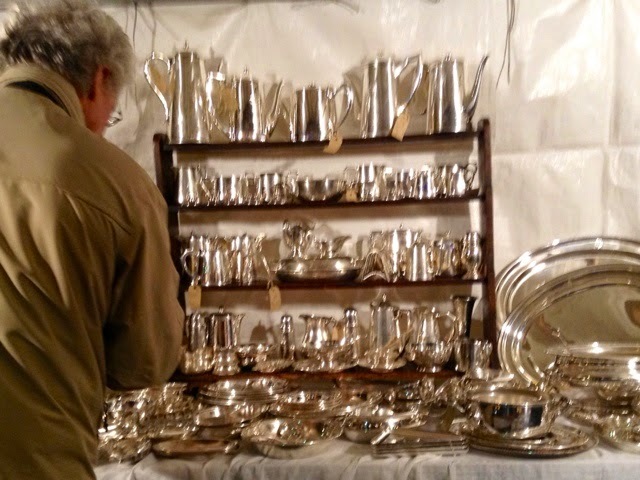 Love your shopping trip -- pens and art supplies and silver and pastry. Honestly, you are my fantasy today! Whiplash is on my schedule, too -- it's playing at odd times, so will see next week. Really excited about it. Ah, BHV. My favorite. Sigh. Just big, huge, sigh! I think if you decide to quite your job as brilliant artist and chronicler of Paris life that you should be a personal shopper for us Americans who aren't getting over to your area! Carol, this post is so filled with a zest for happiness and beauty. Thank you for sharing that atmosphere and sensitivity with us. Isn't it fun to acquire a new watercolor set? No matter how many I might already have, a new one is always an excitement. 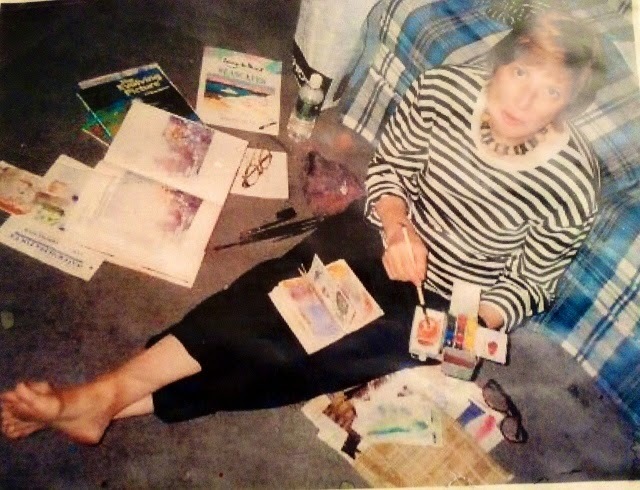 Great to see the photo of you amidst your painting, too! So true Frances. I spotted that box across a crowded room. I am glad that you are doing well,and still doing the tough job of tasting those pastries for us. Thanks as always for the peek into Parisian life,and ooh,that includes you Miss Carol. Thanks for this post...glad to know that you and Paris are OK. Pastry will always triumph! Thoughts are with you. You are so lucky to be in Paris! Would you say that you will stay there for the rest of your life? I ask because this morning I woke up and could see a partly cloudy sky from my pillow with brilliant rays of sun coming through. For some reason, I thought of Paris even though I have not ever been there. I am thinking of where one would want to be for the rest of one's life. For you, is it Paris? I love that photo of a younger you. Why do we want to still look like we did back in time? How do some women seem to be able to look the same? Wish I knew. YES yes and yes ! Slowly the city comes back to life. Real estate has never been higher . Wasn't 'Whiplash' mind blowing? Wow!!! I'm glad things are getting back to a perhaps a "new normal", at least for the near future. 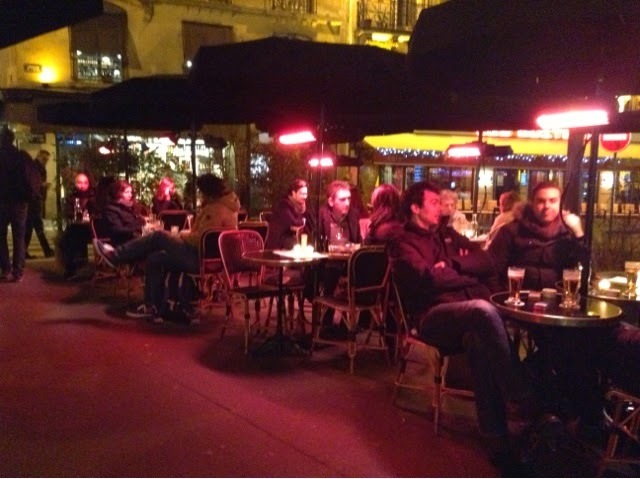 How lovely to be able to sit outside at a café in winter. I admire the French for that. Thanks for showing some scenes of Paris. 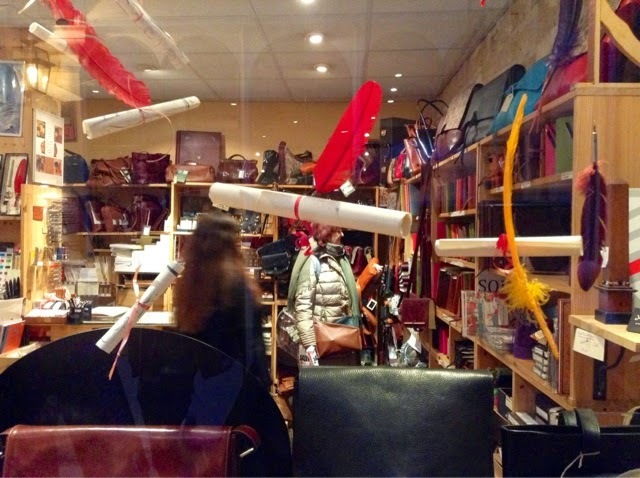 The pen store makes me want to book a reservation now! 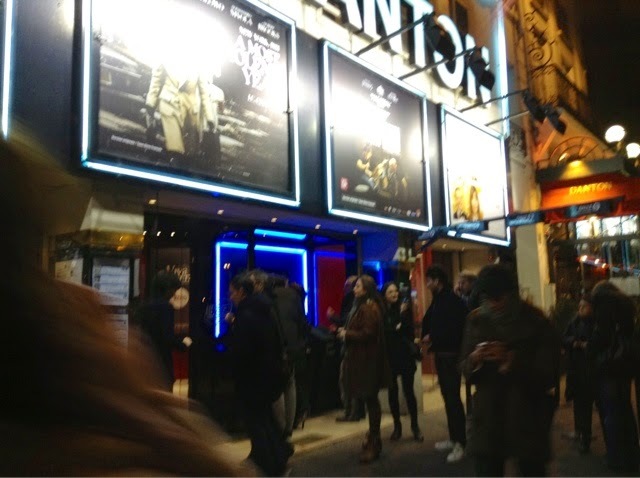 And I love that movie theater & that whole area of Paris. Can one ever have too many paintboxes, I ask you? Paintboxes are like lipsticks. You buy them whether you need them or not. Fun! It would seem there is always a festival of food in Paris and something to celebrate - Viva la Paris!! thank you. gorgeous post. can’t wait for my 10 weeks beginning in mid april in the marais and then the 6th. Thank you for reminding us that terror can not win. It may make us grieve our losses, but LIFE always wins over death and destruction. Do you have pen recommendations? I'm experimenting currently, but mostly frustrated. And there's no lovely pen shop just around the corner to help me out. Hello and thank you soooo much for that vote of confidence for my impending trip to Paris!!!! Merci! Nice post Carol - and of course, life goes on, just with more awareness and perhaps a little more wariness. Glad to hear all is well with you. 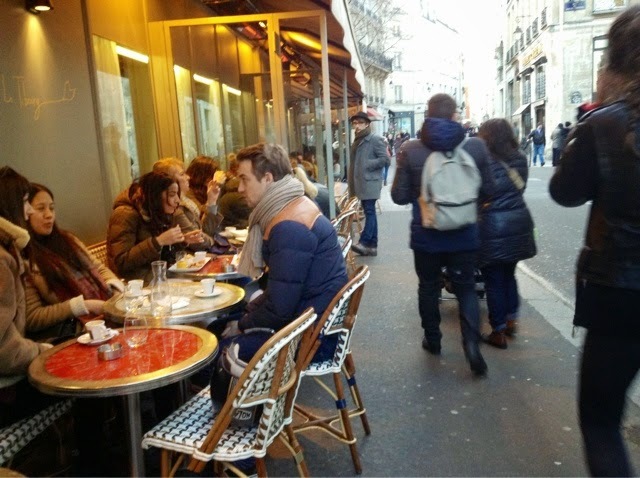 Love your goal of sitting in cafés more often - my favourite pasttime in Paris for sure! I love Paris even more. Hugs to you, Carol. Terrific post. Great post, Carol! Have just linked to it in my weekly blog post. Cheers from across the Channel. Thanks for the post Carol, Rich Nuckolls shared your blog with me. I am one of the painting instructors in Giverny this year. I'm organizing a group for June 4-11 and hoping the recent tragedies in France will not dissuade people from joining in on a remarkable opportunity to paint at Monet's Gardens. I believe you have been there before and know how wonderful it is. If you know of anyone who might be interested in participating, they can learn more on http://www.artcolonygiverny.com/ Thank you! 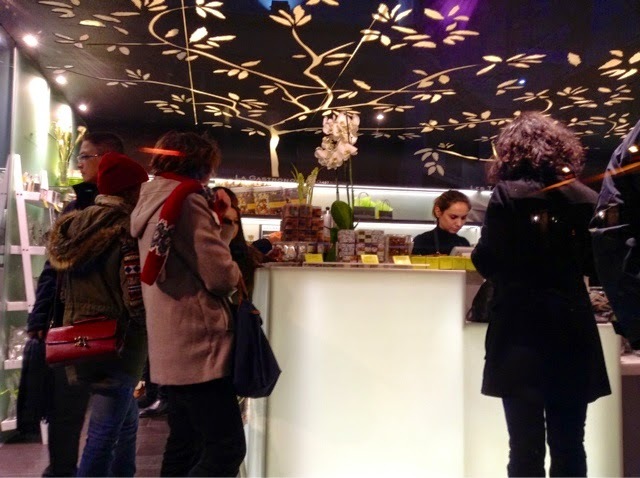 I see Clotilde from blog Chocolate and Zucchini in one of the pictures! Love her, and you! !